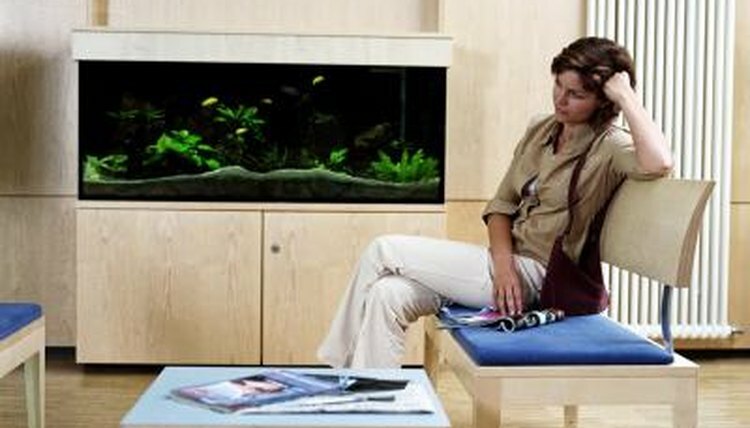 An air or water pump can destroy the aesthetic value of a freshwater aquarium. They’re large, mechanical-looking and generally an eyesore. It is possible to hide a pump without hindering the device. You simply need to place it behind an aquarium background. Purchase an aquarium background from your local pet shop. Backgrounds are sold in different measurements, ensuring you can find one that fits your tank size. An aquarium background hides anything that’s behind the aquarium, including pumps. These backgrounds feature printed designs of everything from aquatic gardens to the lost civilization of Atlantis. Alternatively, you can create your own background by measuring a piece of black poster board and cutting it to the scale of your aquarium. Empty your aquarium of all aquatic life, décor and water. Store fish in a bucket or bowl until you’re ready to reintroduce them to the aquarium. Keep the aquarium’s water in a bucket, but be prepared to add new water when you refill the tank because some water will be lost during the transfer. Line the background up with the back of your tank. Ensure the scene is visible from the front of the tank. Typically, backgrounds feature printing on one side and nothing on the other. The scene should face in, so you can view it from the front of the tank. The blank side will be visible from the back of the tank. Trim the background using scissors, ensuring the background perfectly fits the tank. The background goes inside the tank, which has a tendency to have a slightly smaller dimension than the outside of the tank. Make sure you're lining the back wall inside the tank with the background and then trim it to fit. Cover the non-image side of the background lightly with application gel. This gel can be applied with a paintbrush or your fingertips. It ensures the background will stay smooth and holds its place. Do not overapply gel, as this will cause the background to slip around. Instead, apply one light coating and then place the background on the inside back of the tank. Use your hands to smooth it down, ensuring there are no bubbles. Apply water-resistant tape along the edges of the background. This tape prevents water from disrupting the background. Without the tape, water could leak behind the background, causing it to fall down -- something that could disrupt your tank’s substrate or injure your fish. Be sure to secure all edges of the background with the tape. Add your tank’s substrate, décor and water. You may need to reintroduce some new water, if any water was lost when emptying the tank. Allow everything in the tank to settle and water to warm to room temperature before reintroducing fish.  Use a razor blade to trim any edges that aren't neat or don't line up with your aquarium's edges.